"I’m hoping that in 8apps, I can provide a suite of 8 applications that provide both an indispensable function and a simple, easy-to-grasp user experience." The current applications in the suite are called Handshake, Orchestrate and Blueprint have been briefly highlighted in this article. The backbone of the 8apps suite is an application called Handshake which is a professional social network for users to make new contacts, strengthen existing relationships. It is more a contact management system that is integrated into the rest of the 8apps products as any contact in Handshake becomes accessible in the other applications. 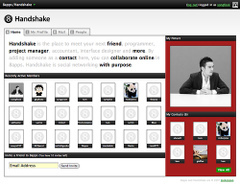 The network enables users to weigh in on their contacts skills which creates an interesting profile graph as shown in the right rail of a profile. 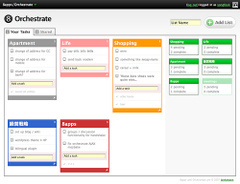 Orchestrate helps you to keep track of your “to do” list or simple tasks. It offers the ability to color coat various lists for better organization. Lists can also be shared with contacts from Handshake. Orchestrate was well received in its initial release and was previously mentioned in the Wall Street Journal. 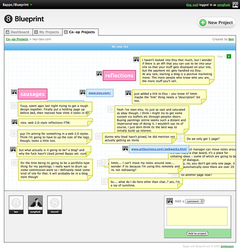 Collaborate with Blueprint as it allows users to brainstorm online by interacting with a number of individuals from Handshake without forfeiting control of the process. The project manager can control the look and feel of the layout by dragging and dropping items around the board. Maybe it is the name, the inviting interfaces, or simple productivity apps but something about 8apps reminds me of 37signals. Nonetheless, I look forward to the official launches of these and other 8apps products to the masses. For more information check out this article on jonkenpon which offers two screen-casts explaining the applications in more detail.